Consider the return on Canadian savings accounts and you may feel that the tax being levied in Cyprus—while an order of magnitude more egregious—isn’t all that far removed futility-wise from what we already experience here. The big news today and over the weekend is of course the legalized theft of bank savings accounts in Cyprus. Politicians do some pretty outrageous things but this one really takes the cake. Ironically, I was watching Rogers Video-on-Demand on Saturday night, roughly when the story was breaking over social media. It happened I was watching the lukewarmly reviewed movie Atlas Shrugged, based on Ayn Rand’s most famous novel. It’s all about how “looters”—generally government-led legal plunderers of private-sector wealth—enable society’s “have nots” at the expense of those who build wealth and jobs. In the end of the book, the captains of industry effectively go on strike (hence the “Atlas” shrugging) and the wheels of commerce grind quickly to a halt. Literally, in the case of the movie, where one of the final sequences shows trains managed by incompetents imploding in tunnels. Whether the Cyprus implosion succeeds in reversing the hard-won rise of confidence in Europe this year remains to be seen. The 9.9% tax being levied in Cyprus over a certain threshold of savings (100,000 Euros; the rate is 6.7% below that level) is mind boggling, given the tiny return that most bank savings accounts payout in a year. I don’t know what they pay in Cyprus but as North Americans well know, bank accounts these days pay effectively zero. In fact, the “real return” net of inflation is almost certainly negative. In Canada, at least, even if you manage the princely return of 1% a year, if you’re in the top marginal tax rate, you can kiss goodbye to almost half that meager return. In other words, the combination of rock-bottom yields, inflation and confiscatory taxation has long rendered savings accounts a losing proposition in this country, along with equivalent vehicles like savings bonds, short-term GICs and money market mutual funds. If one really must “park” some funds in such instruments, it’s best done inside Tax-Free Savings Accounts. But outside RRSPs or TFSAs, it’s certainly a losing game, which is why now-retired actuary and retirement expert Malcolm Hamilton used to regard any savings or investments outside tax shelters as essentially “futile.” He even viewed longer-term fixed income instruments and equities as equally futile. When you think about it, it’s pretty outrageous how “safe” cash equivalents and bonds are taxed even on this continent. I once wrote an editorial for the Financial Post that made the case for TFSAs. I felt the average consumer is only half aware of how hard it is to build wealth outside tax shelters. Once you do realize it, you may feel that the tax being levied in Cyprus—while an order of magnitude more egregious—isn’t all that far removed futility-wise from what we already experience. Consider what happens if you want to put $1,000 into some cash vehicle paying 1%. To get that $1,000 capital, someone paying an average tax rate of 33% first has to earn $1,500. About $500 of that goes to income tax, at which point you now “invest” in a “safe” money market fund or equivalent. If it’s not held in an RRSP or a TFSA, each year, that $1,000 investment will spin out the princely return of $10, which at tax time will incur a $4.60 tax liability, leaving you with $5.40 net. If inflation is at 2%, you’re actually losing ground, since your original $1,000 of capital now has enough purchasing power to acquire about $990 worth of goods. And of course if you’re in the top tax bracket with a top marginal tax rate of 46%, the situation is even more dire: as a reader commented below, it would require $1,850 of gross income to generate $1,000 after-tax capital. Remember, that’s not Cyprus: that’s right here in Canada. Now if our government were to emulate Cyprus, you’d experience the further outrageous “tax” of $99 from your $1,000, or $67 if you’re a small saver. 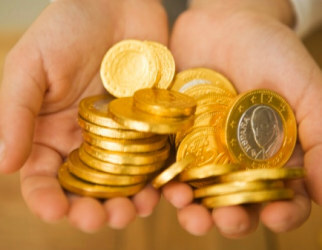 Anyone in their right mind would prefer to put paper money under the proverbial mattress or better yet, buy gold or silver coins or bullion and put it in a safety deposit box. Maybe that’s why the price of gold has been up since this Cyprus story broke.